Okay, so one of the most frustrating and nerve-wracking thing about going on a multiday kayak expedition/adventure is what to bring. It would be so great to have a complete kitchen cookset with a sink (really!) but we really can’t complain. As kayakers we can carry about twice what a backpacker can carry, and it doesn’t even have to be lightweight. There are two major categories of stuff- your gear and your food. Read on to see the pared down list I bring on my expeditions, both solo and when I’m guiding. The passport. Yes, I’ve forgotten it before but luckily the border folks see me enough in the summer that I was able to slip through. Never again! Sandals & Aquasocks – I like to paddle in aquasocks, not booties, as they are smaller and lighter and fit better in the boats. I always bring at least an extra pair of flip flops for dry land, but I’m also really good at walking around in flip flops on tough terrain. Bring your shoes if you have space. Fleece pants / fleece top – Okay, so as much as I am an enthusiast of primitive skills, it’s true that fleece dries fast and is warm when wet. These two qualities are amazing when on a multiday trip where you’re getting wet constantly, particularly here in the Pacific Northwest. Wool cap / toque – This is one really easy way to regulate your temperature on the water and while camping. Sweater – No matter how warm it is in the day, you will get much colder at night. Small towel – A microfiber towel does wonders, not the least of which is for something to wipe your hands on when cooking or after cleaning. Sunglasses – Don’t forget polarized glasses! Your head will ache badly from being on the water all sunny day. Sleeping bag – I love how small down bags compress, but synthetics are a must on the open humid air of the coast. Camp tarp– I’ve made the mistake of traveling without one, and it’s great to have a tarp to shelter under when you’re not paddling for days at a time due to inclement weather. You can also use it to gather water. I bring a nice Kelty tarp which packs tiny, but even a poly one will do well. 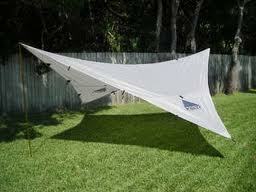 Tent – Remember, there are high winds and there’s no place to go to repair your tent poles should they break. A high class tent has a low-profile to the wind, a bathtub bottom for camping close to the high-tide line and is constructed well. Sleeping pad– Though I sit on one in my boat, I like to have a dry one packed away to sleep on at a moment’s notice. If you use an inflatable, it works well to have the foam one in your boat to sit on as a backup in the event of a puncture. 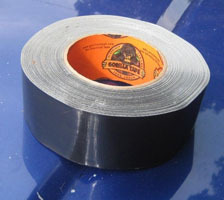 Boat Repair: Duct tape/Aquaseal – Okay, so it’s not a camping item, but always bring good duct tape. I highly recommend Gorilla tape, as it is waterproof if applied when surfaces are dry. One of my friends has a boat four years old with the original Gorilla tape patch on it still holding. I would like to include my first aid kit for expeditioning, but take note– none of it makes any sense and is much use if you don’t know how to use it! If you have no wilderness medical training, I recommend it! It’s pretty cheap for a Wilderness First Aid course, and only a weekend in some cases! Sunscreen – No one should forget this! Even dark skinned people burn when exposed to the elements all day long. SPF Lip Balm – Likewise, we get burns on our faces reflected from the water. Personal Sheath Knife – Hopefully it does double duty as both a kitchen knife and a useable utility knife. I highly recommend the stainless steel mora knives by Erik Frost of Sweden. You can buy them at a marine supply shop or online. Fillet knife – Though your regular knife works for this, a fillet knife is both a backup knife and very good at what it does. A folding one is really nice albeit hard to clean. In general, my philosophy on kayak camping is to bring only what you need. If there’s abundant driftwood and you can make fires, why bring a bunch of stove fuel? Keeping that in mind, here’s my list for cooking over (small) open fires. Cooking Pots/Pans – Stainless steel is by far the winner. Aluminum has health-associated problems and dings easily, titanium simply does not cook well on. Stainless cooks well and lasts forever, and does not have terrible nonstick coating which scrapes off and burns in a fire. I use the MSR set, which has two pots, a lid/pan and a grabber. A great kit for a great price and it all packs into one pot. Cutting Boards – A couple of HPE cutting boards makes filleting fish so much easier, and keeps your food clean. 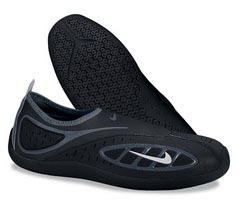 They’re easy to store too, as they slip under your SOF kayak’s seat pad. Camp Sink – A sink is handy if you have the space, but I often clean pots and pans in tidepools with no life in them. Saves space and you don’t have to run away every time a wave comes. 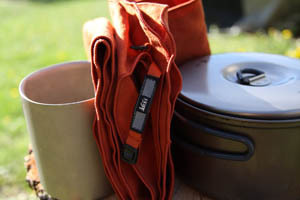 More accessories not to forget – Utensils / Mug, Camp Soap / Sponge, a micro Camp Stove / Fuel for morning coffee. Okay, that’s a long list! Next time, we’ll look at some diagrams of how to pack a skin-on-frame kayak, which can be tricky but in the end is faster than with a bulkhead-and-hatch boat. Great article. My son and I were able to make a list from your info. We are looking forward to trying out your suggestions this spring.